A full day with lots of players including new ones. Mazal tov to David for winning all his games, including ones he just learned. Gili watched a video on how to play Argent The Consortium and they were ready to play, but then gave up. Thank you to Yona for taking some of the pictures. Special thanks to Jon for organizing the food order and driving over to pick it up. We missed Shirley, Emily and Eitan. Jon: I taught Gili and Elisheva. Gili started off with a commanding lead, but I was also making progress. Actually, I was shoring up some resources and alien power cards. Eventually I started attacking Gili (stole her resources) and took the shield card from Elisheva. I also got a plasma cannon to remove pesky ships in my way. I noted to them that the special abilities of the cards were powerful, especially the ones that move bases around. Elisheva used one in the last round to try to thwart my victory, but I had an equivalent one to undo what she did. 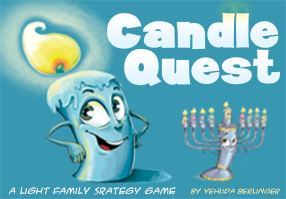 One of Jon’s favorite games, Elisheva wanted to play. Jon: I kept a slight lead throughout the game. My secret is simply that I constantly evaluate exactly which points I am aiming for and I work straight for the points. I don’t worry about losing cities or armies if I don’t need them anymore. I worry about what the others are doing only if my path to a specific point card is blocked. With more aggressive opponents, I have to spend more time shoring up defenses, and the game drags as a result. 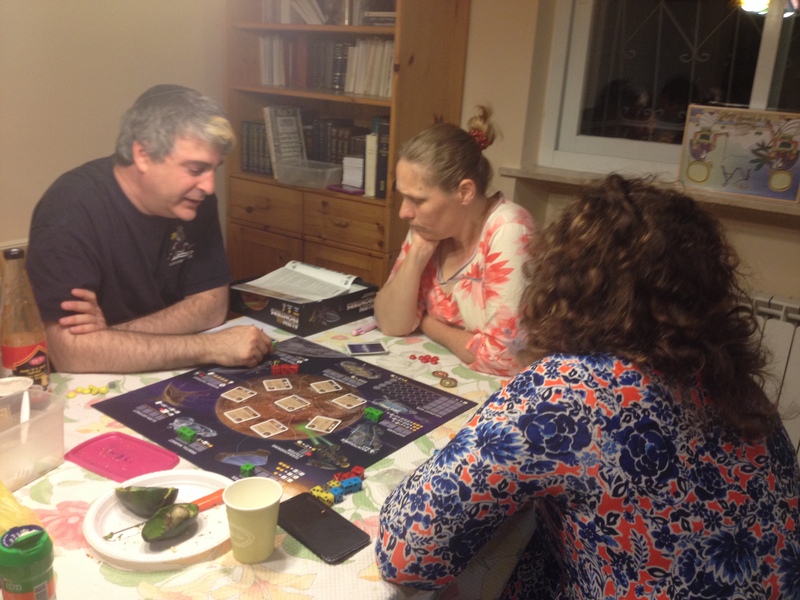 We played for a while, fun and interesting, with table talk and assistance on bidding. Avi and I set them a few times, and we all made a few. Ben and Binyamin always know who has what and what’s going on with everyone. Jon: I can barely remember this, but the essential part is that you control certain areas and spread out from there. You gain points from surrounding certain pre-existing areas on the board with the majority of armies, or from certain actions, or from building temples. You can do these things only by building all of the other things first, which rate limits the game. I pulled spectacularly bad cards hand after hand. You have to have certain cards in order to make progress, and I couldn’t draw them for the life of me. Eventually I gave up on ever getting a temple; my path, then, was to end the game before anyone else could build their second temple (they all already had one). I managed to end the game a turn before at least two other players would have gotten their second temple. Binyamin complained good-naturedly about this, but he still won by a third more points than the next player. I was barely not last. This game is a pain to play with people who don’t know it well, since there is a lot of calculation to do and there is nothing to do when it is not your turn. With experienced players it probably plays fairly quickly. I do worse at this every time I play but I like the game, everyone did. New to Ben, David, Avi and Eszter. 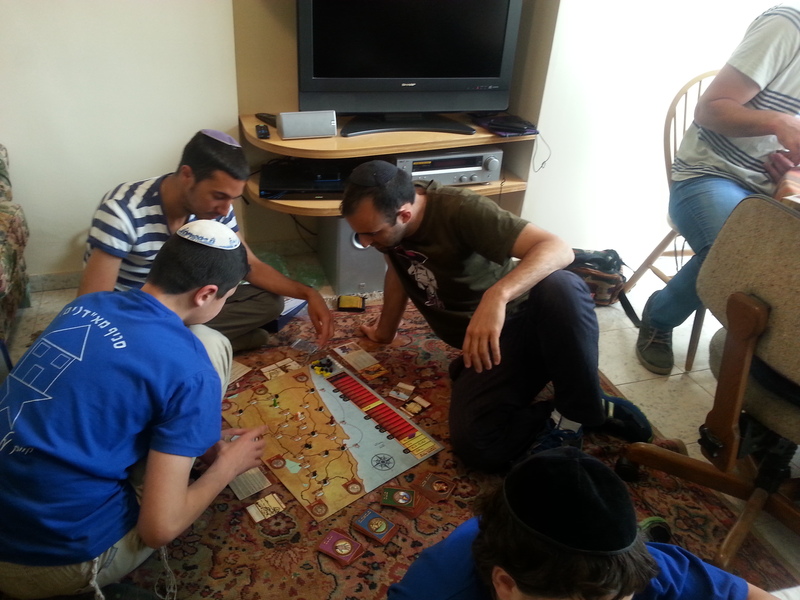 Eli, Ron and Avi won at Pekach, the last king. Jon: I taught this game, which is very each to teach. It’s not a high tension game, since you usually have what you need to do various things, so you’re always moving forward. Unless there is only a single source of something and you’re not trying hard enough to go first to get it (or work around the worker placement restriction). Elisheva was fairly close behind me, but Assaf jumped ahead in the end by finishing a few more quests that were also the right type for his Lord. Jon has 5,000 new cards and 3,000 duplicates. Jon: We played two sets of games, each set was a draft followed by best of three games. I won the first one in each set, then lost the second one due to mana problems, then lost the third one stam. In the first set I had some blue card drawing and scrying, and a few cards to take out David’s flyers (which he never got out). In the second set I had tons of creature control. I won the first game with that, but he won the third game because he kept bringing out more creatures (and he had one that popped out of the graveyard every round). Two games, Avi and Yiska each won. Gili’s game, new to Elisheva. Avi had only played once a while ago. First play for Ron and Eli, we played to 500. I called a Tichu, Avi started with a 5 straight and called a 7; I could legally play the 7 in a straight using the Phoenix, so I had to play it and mess up my hand, plan, and Tichu. They beat us by around 500, they both managed to keep having the dog at the exact right time to save each other. Jon: We had two grand Tichus, both made, including the one I opened with on the first hand. The last play of the last hand was also nifty. David passed to me leaving him with a single card. I played out everything and then passed back to him with the dog. Gili taught this, close game. First play for all of them. Binyamin did a good job with wood and food for more farmers, he ended with 5.